Swim: The swim is one lap clockwise of the lake and is very clearly marked with buoys. Most years the water has been comfortably warm and some competitors even choose not to wear wetsuits. The swim exit is sandy and soft underfoot then a short run on grass leads to T1. Bike: The bike course consists of two slightly different laps on roads in the Cheshire countryside, with no major climbs to contend with. The bike leg finishes back at Allostock Village Hall where you will find T2. Run: The run starts with a short section on a minor road before two out-and-back laps on closed roads. This is shaded by trees and there is a drinks station at the start and end of each lap. All that remains is a sprint finish back to the Water Park & the finish line overlooking the lake. The flat run course starts with a short run along the road to 2 laps of a traffic-free out-and-back section. Finally it’s back onto the road for the “home straight” to the finish line back at Boundary Park. A detailed map of the course is shown below. The majority of the run course is on private land and we only have permission to use it on race day. So please do not try to practice on the course at any other time. The race is staged at the Boundary Water Park with race headquarters at Allostock Village Hall which is minutes away from the motorway network. Knutsford, Holmes Chapel and the City of Manchester are all nearby. Click the area below for directions. Refreshments and parking are available at the event for both competitors and spectators. The race is staged at the Boundary Water Park which is very close to the motorway network. Refreshments and free parking are available at the event for both competitors and spectators. Allostock Village Hall, Allostock, nr Holmes Chapel, Cheshire WA16 9LQ. Please do not park at anywhere on the race course and also avoid parking on the A50 near Boundary Stores, as this causes issues for the local store and is a safety risk for athletes leaving T1. From the motorway roundabout J18 take the A54 for Congleton and Holmes Chapel. After travelling 1 mile you will reach a roundabout in Holmes Chapel. Take the first exit onto the A50 signposted for Knutsford. 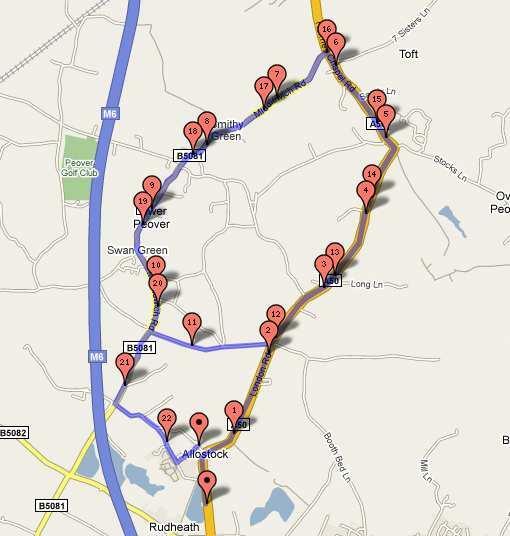 From the Holmes Chapel roundabout you are about 2.5 miles down the A50 from the race venue. 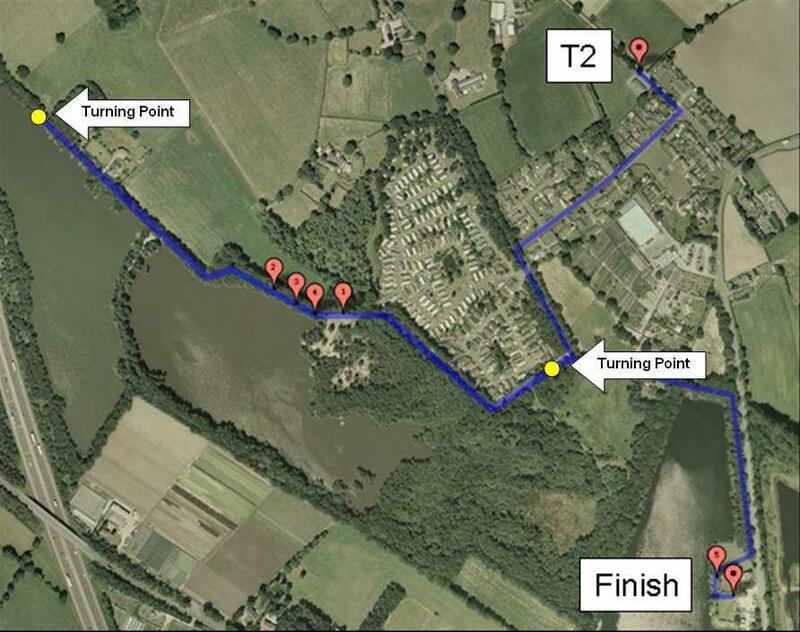 After driving 2 miles from the roundabout you will pass the Boundary Water Park where T1 and the swim is situated. You cannot park here. Continue on for 0.3 miles and after passing the garden centre on your left hand side you should take your next left into Chapel Lane. Drive down to the end of Chapel Lane and continue down the unmade road to Allostock Village Hall which is the car park, registration and transition 2 area. From the motorway roundabout J19 take the A556 dual carriageway signposted for Manchester, Manchester Airport and Tatton Park. After travelling 1 mile go straight through the first set of traffic lights with Mere Country Club on your right hand side. At the next set of traffic lights, facing the Swan Pub, turn right onto the A5034 signposted for Knutsford and Rostherne. After driving 1 mile you will reach a T junction at which you will turn left onto the A537 signposted for Knutsford. Travel along this road for 1.5 miles and you will reach Knutsford roundabout where you should take the second turning – the A50 signposted for Stoke. From Knutsford roundabout you are about 5 miles down the A50 from the race venue. From the roundabout continue on the A50 out of Knutsford through two sets of traffic lights. After driving 4 miles from the roundabout you will pass Mangoletsi Fiat and Alfa Romeo garage on the left hand side. Continue 0.3 miles further on and you will passs the Cottage Restaurant and Lodge on your right hand side. Continue 0.3 miles further on and you will pass a brown and white sign for a garden centre on your left hand side. Take the next right into Chapel Lane. This was my first triathlon and I was encouraged so much all the way around, it really made my day. The race has a very friendly atmosphere. Back for the third year running and its great to have a lake swim rather than a busy pool. The family like it also as I take them to the Trafford Centre afterwards! I like the flat course very much as I am not very good at cycling. Today’s cycle course has given me a personal best time. Which is always good for the ego. Results from previous editions of Boundary Breeze may be found here.